Long Way from Lambeau: 3 Months already. Wow has it really been 3 months since I posted on here? Yikes. Well to be honest it's been quiet in the realm of the Packers. We won't be making any waves in the draft and we don't seem to have any drama brewing with the team this off season. I've picked a few cards up. Read a few articles about the health of the team, yada yada yada, but since the only football releases have been insanely high end or Panini, I've not been in a football mood. That said the real reason I wanted to post something here is so I don't get booted off the blog rolls for inactivity and can reset the clocks. Petty I know and I apologize if you read this post thinking there would be something of substance. I've been pretty busy posting over at Collector's crack and even on a few of my team and player specific blogs, just not here. I will share my one and only Packers TTM success so far. I've only sent one so I'm batting 100%. Plus if you read Collector's Crack you've already seen this. One is for me the other for part of my brother's birthday present. 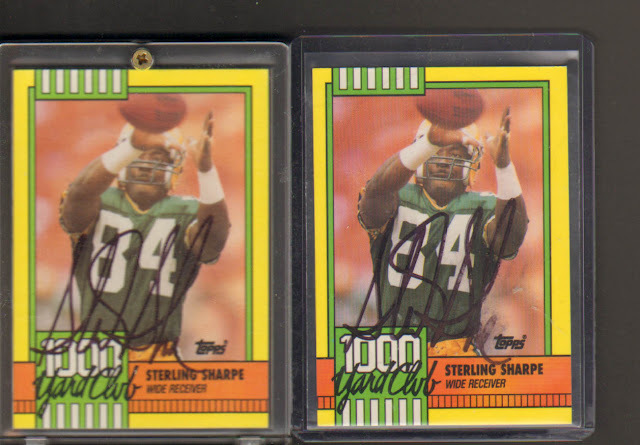 I just picked up a set of 89 Score Supplemental football for super cheap and am half tempted to send Sterling's rookie card to him to sign as well. I think I got these two back in less than 2 weeks. I sent them to the NFL network address. You can see the full write up over at Collector's Crack.